The United States Department of Agriculture (USDA) is responsible for publishing Dietary Guidelines for Americans every 5 years. These serve as the basis for school lunch programs, nutritional recommendations in hospitals, and are held as the social norm for what is considered healthy eating. You can find the previous USDA reports (1995 to 2005) here, and the current 2010 one here. If the guidelines had our best interest at heart, they would reflect the latest nutritional research and objectively inform us of the best possible diet to fend off chronic disease and reverse the rise of metabolic syndrome. Unfortunately, that’s not entirely the case. The guidelines are more a reflection of political forces and a tool to market US-made food products rather than a guide to better the health of Americans. Following on last week’s article, I’d like to look at the long-standing relationship between the USDA and processed food manufacturers. Case in point: the ready-to-eat breakfast cereal industry. In 2014, the total breakfast cereal sales were slightly over $10 billion in the U.S. alone, thanks to over 1500 different cereal products on offer on the shelves. And what are they selling? Cooked, ground, dried, and re-shaped wheat or corn, coated with sugar, food colouring, and synthetic vitamins. Perfect picture of health? I’m leaning more towards a cause of diabetes. The USDA, like its name suggests, is more so responsible for insuring the health of American agriculture than the well-being of the American population. Obviously under the pressure of powerful lobby groups, it does not come as a surprise that the USDA would have for aim to promote this very profitable sector of the US economy. So, how does one convince a population that Frosted Flakes, Special K or Lucky Charms are healthy breakfast choices? Simple: recommend between 6 and 9 servings of whole grains per person per day, and assure us that breakfast cereal is included in this ‘whole grain’ group, along with bread, rice, or pasta. Right this way! In the 2000 Dietary Guidelines for Americans, while encouraging an increase in consumption of whole grains, the USDA provided a sample ingredient list that consumers could use to recognise and purchase a healthy ‘whole grain’ food. Shockingly, the list contained high fructose corn syrup as its third ingredient. This achieved two things: it made people comfortable with the idea that a ‘whole grain’ food is composed of a cohort of ingredients listed on the label, therefore inherently processed. This also planted the idea that a healthy option for a ‘whole grain’ food is something sweet, containing sugar. Cereal manufacturers add a lot of high fructose corn syrup (also named corn syrup, glucose syrup, maize syrup, glucose-fructose…) to their products- Americans now had the USDA’s approval to buy ‘whole grain’ foods with this deadly sweetener, and many others, in them. Perfect! There we go, a whole grain breakfast cereal with high fructose corn syrup, for a whooping 17g of sugar per serving. Fair enough… But a couple lines later, they add a precision: foods with added sugars are to be avoided, except in the case of “chocolate milk, presweetened cereals, and sweetened canned fruits”. Really? That’s interesting. Their argument is based on the fact that these 3 exceptions are also “high in vitamins and minerals”. So in the case of cereal, chemically synthesised folate and iron which are sprayed onto the processed wheat are supposed to totally counterbalance the insane amounts of sugar present. In the subsequent 2005 and 2010 guidelines, it’s the same story, with even more emphasis on increasing our whole grain intake and reducing refined grain products. The USDA still encouraged the consumption of breakfast cereals, as long as these fell in the ‘whole grain’ category. 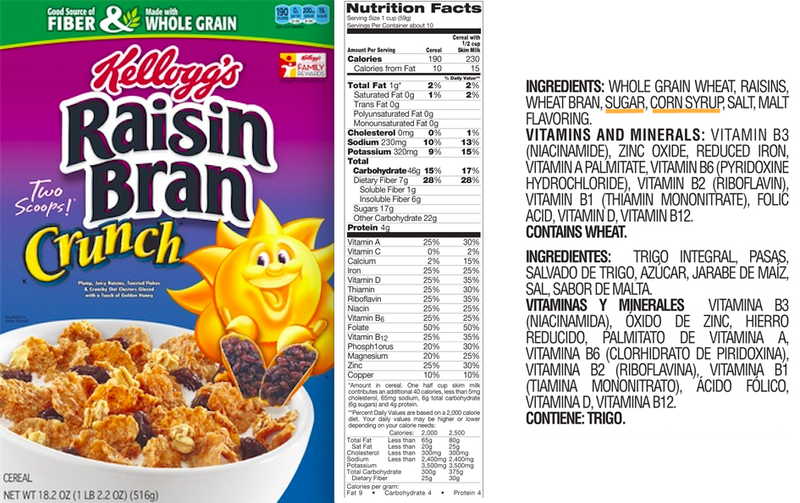 If we were to create a breakfast cereal which consisted of 51% whole wheat, and 49% High Fructose Corn Syrup, we would be allowed to write “whole grain” on the package, and it would count towards reaching the recommended 6-9 servings of grains per day. Of course, manufacturers started marketing their cereal products more heavily as ‘whole grain’ instead of using the refined version. 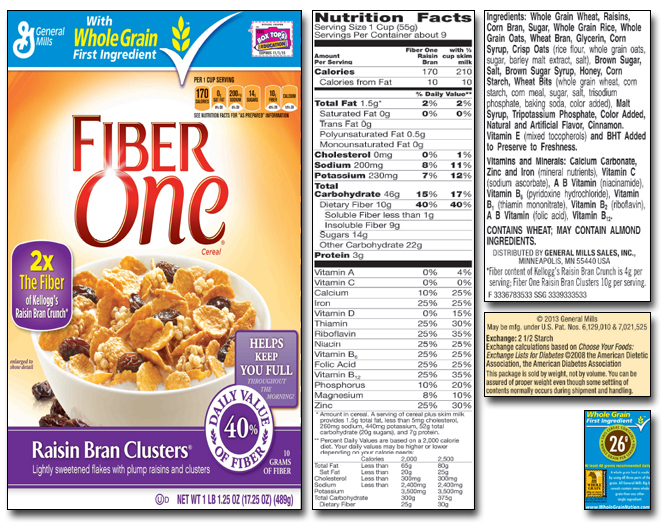 A great little example: GM’s Fiber One. It fills the requirements to be a ‘whole grain’ product- but sugar comes up 6 times in the ingredient list, and a sample serving provides 14g of it. 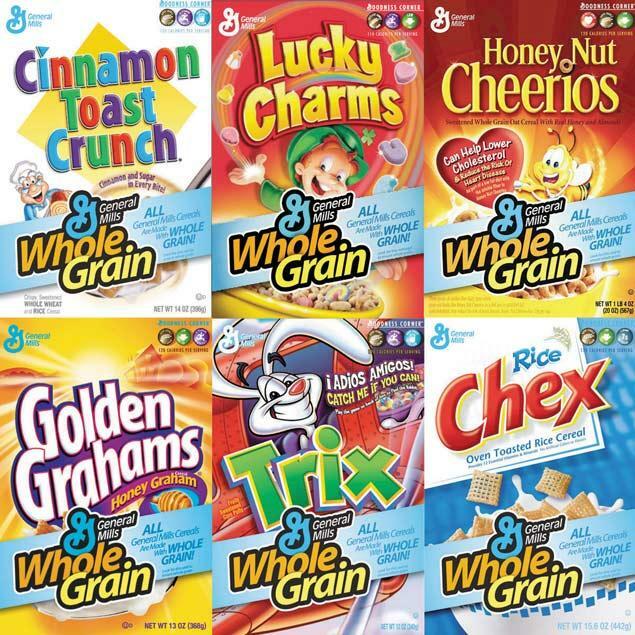 So, according to the ‘whole grain’ requirements above, the following cereals (and there are many more), are to be counted as a part of a USDA-cautioned carbohydrate-rich healthy diet. Finally, the USDA Research department is notorious for leading studies which vouch for the healthiness of breakfast cereals. Difficult to be unbiased. Let’s sum this up. The USDA has helped the ready-to-eat cereal industry by advocating for their products to count as part of a carbohydrate-rich healthy diet. Truth is, even if their first ingredient is a whole grain, the amount of sugar in breakfast cereal do not make them healthy at all. Realistically, they should be placed in the ‘sweets and deserts’ group. Don’t fall prey to the dubious health claims and heavy marketing. Avoid sweetened cereal, make your own granola, or look for alternative products on the top and bottom shelves (which have less money to buy prime supermarket real estate). Or simply eat real, unprocessed, whole grain foods instead. → Correlation Is Not Causation: Let Them Eat Meat! Good article by Jessie Inchauspe… Up to a year ago when I was a couple of waist sizes larger, I often enjoyed tasty “heart healthy” breakfast cereals The post does not mention that the USDA has a “strategic alliance” with a group called the Grain Chain. The Grain Chain includes American Bakers Association, Wheat Food Council, Grains Food Foundation, National Pasta Association, USA Rice Federation, General Mills, and Kellogg’s. Considering this, I think grains will continue to make up at least a quarter of the USDA’s MyPlate icon for a few more years. Before then, there will probably be other countries that get the root cause of the metabolic syndrome epidemic figured out and take the lead on nutrition recommendations. By the way, the period for submitting comments to the 2015 Dietary Guidelines Advisory Committee has been extended to May 8, 2015. I am getting some comments ready for them.